Machu Picchu was a dream, but that may have been because I was half asleep when I got there. Dave and I began our assault on the Machu Picchu mountain at 4:15 in the morning. 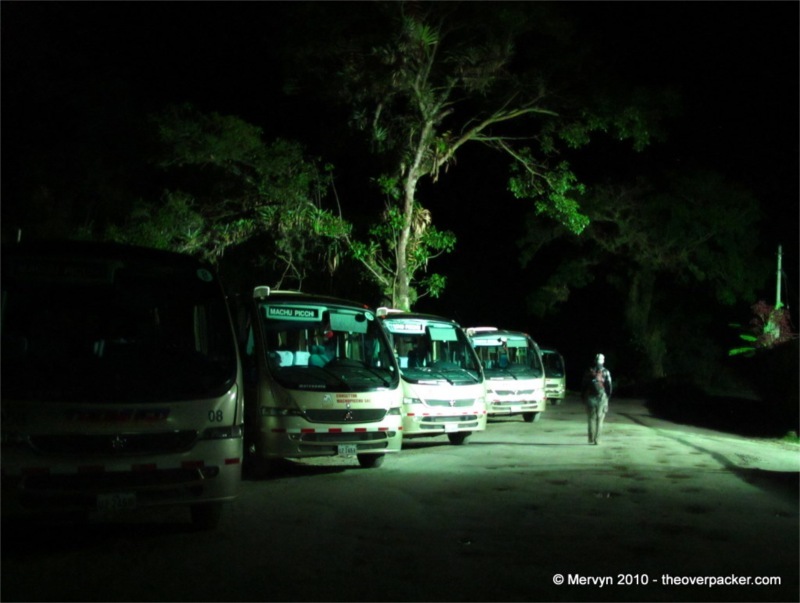 We left Aguas Calientes just like we arrived: in the dark. We didn’t meet any other tourists on our chilly 1.5 km walk to the bridge that crosses the river to the mountain. Turns out that’s because all the most ambitious tourists were already there, waiting under incandescent lights at the locked gate to the bridge. The bridge didn’t open until 4:45 a.m. 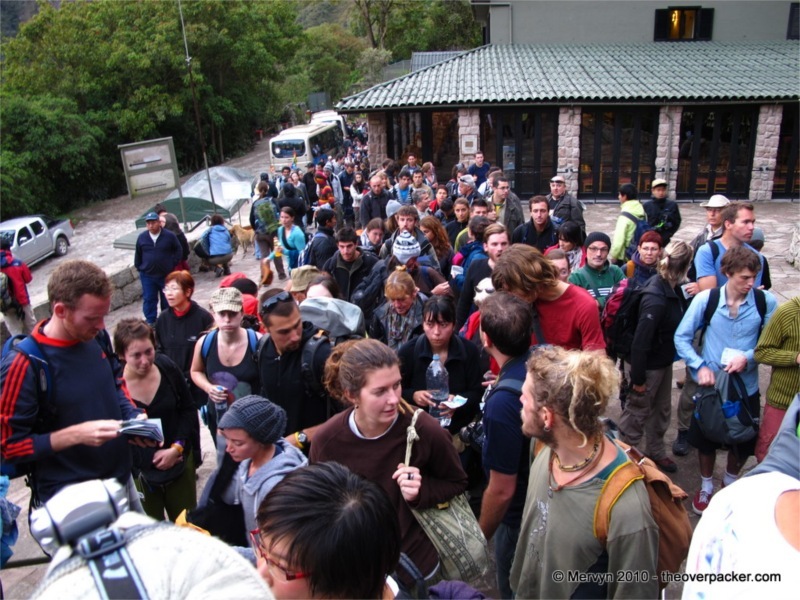 When the guard let us through, 40 of us streamed up the road to a footpath up the mountain. 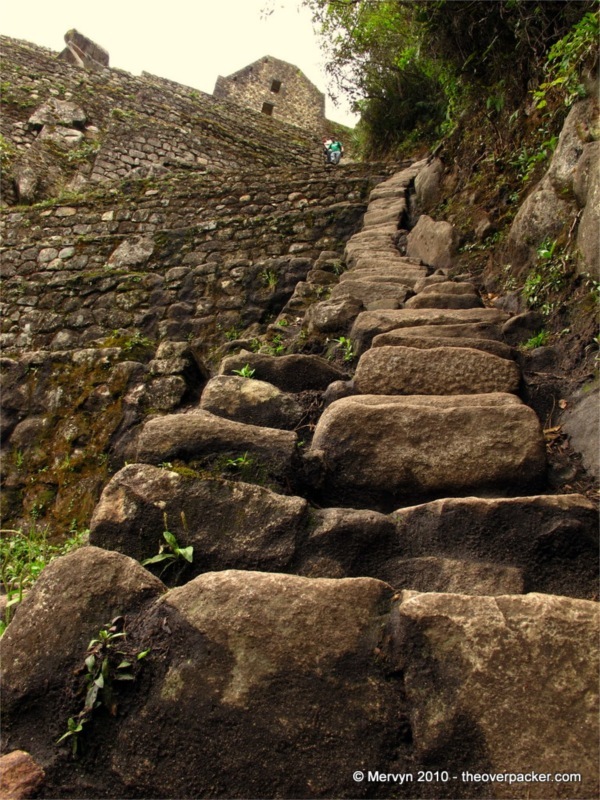 When the Incan emperor Pachacuti (“the earth shaker”) would visit his palace in the clouds, he would have traveled on a trail up the mountain similar to ours; one made of dirt and stone steps. The difference is that he would have been carried on a litter by servants trained from birth to walk with a smooth step. We, on the other hand, spent one hour marching in the dark up nature’s stair master. It must have been nice to be the king. 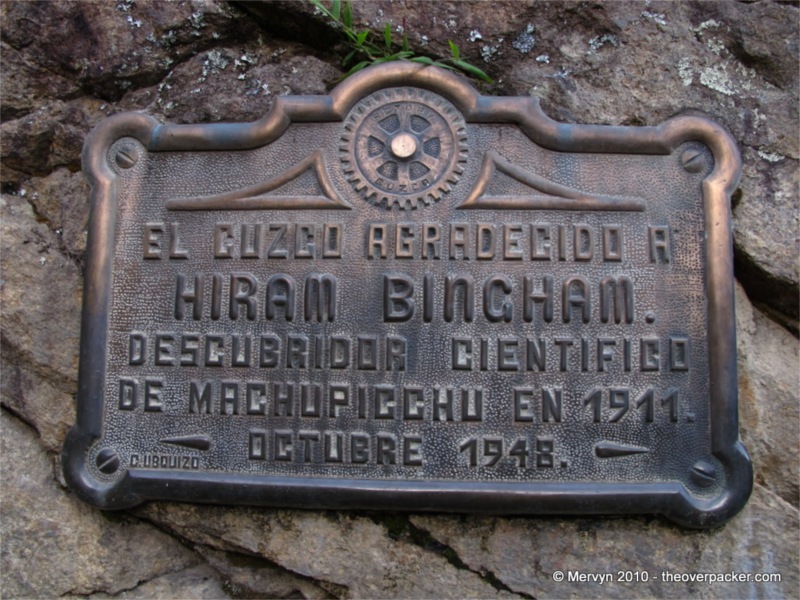 Hiram Bingham, the American who rediscovered Machu Picchu and introduced it to the world, came to this place led by a farm boy. 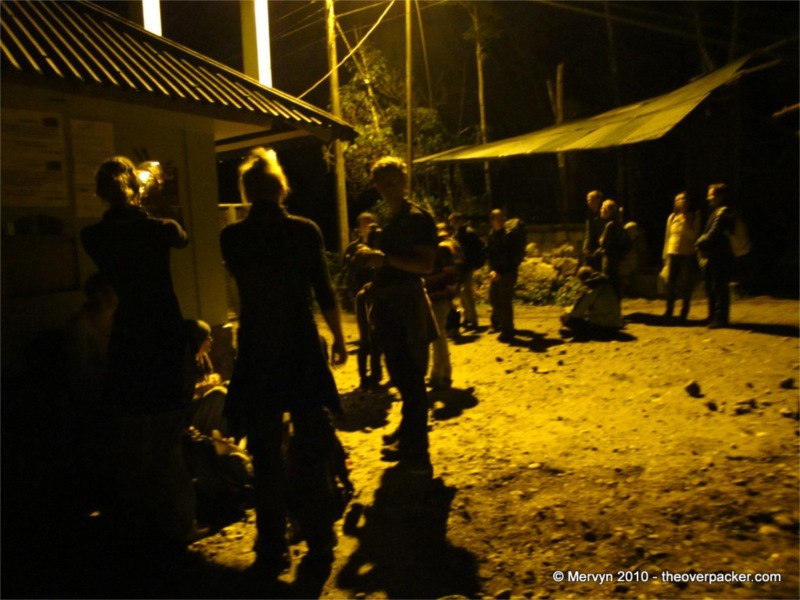 He stopped at a hut around the corner from the site and had tea with a family who leased the land from one of his guides. 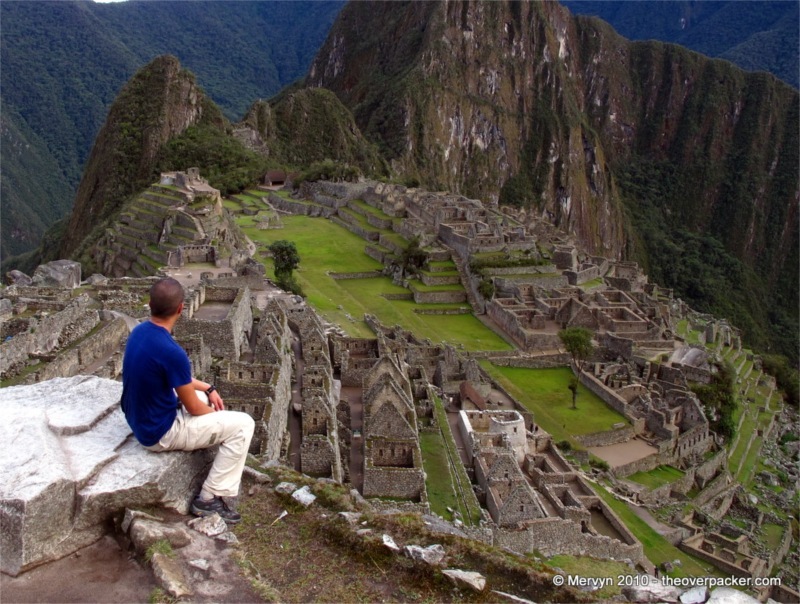 When he reached Macchu Picchu, he had no appreciation for what he’d discovered. He was disappointed, in fact, because it wasn’t what he was searching for. 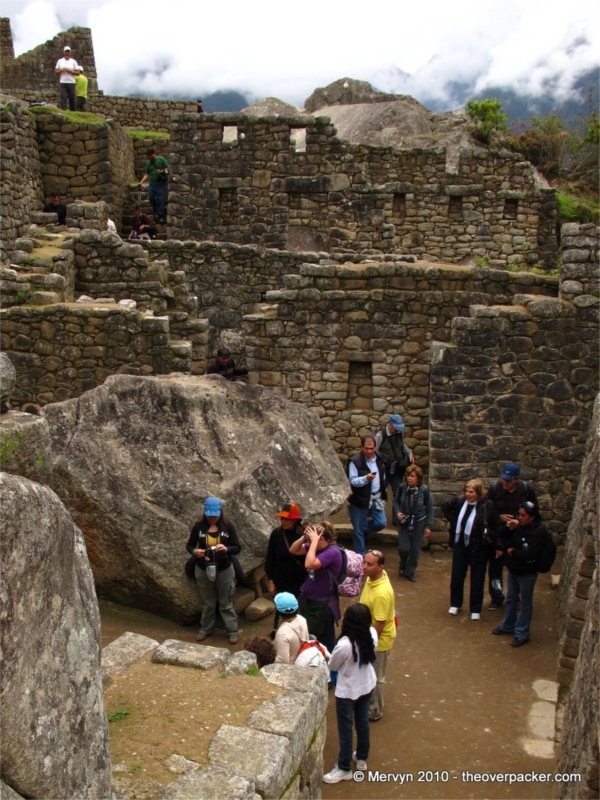 The site was covered in jungle and didn’t match the description of Vilcabamba, the lost Inca rebel capital. He explored a bit, snapped a few pictures, and descended. He didn’t bother to return the next day, believing he’d find something bigger and better further in the jungle. On his first visit to Machu Picchu, he spent less than a day at the site that would make him famous, propel him to become a U.S. Senator, and get him a plaque on one of the world’s greatest archeological finds. We, on the other hand, knew what we were in for. We were here to visit an Incan palace. 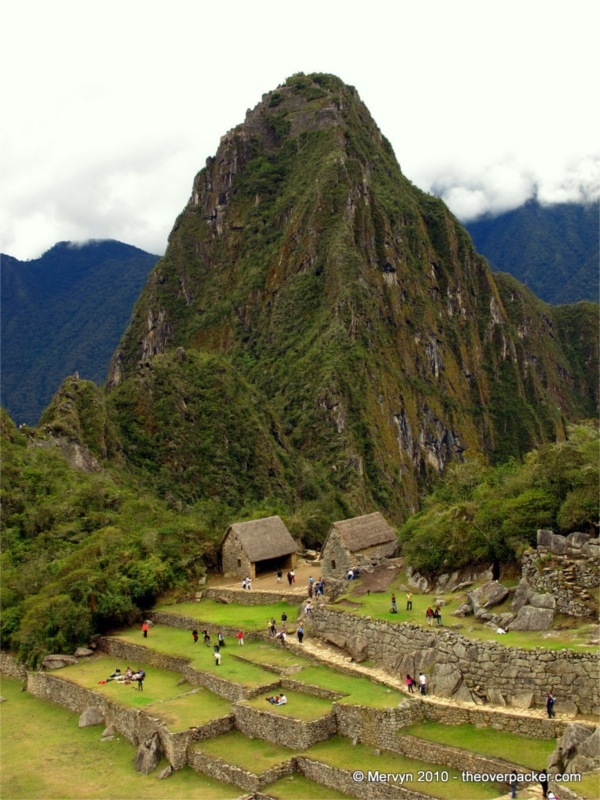 As one historian put it, Machu Picchu was the first Incan emperor’s executive resort—his Camp David in the sky. 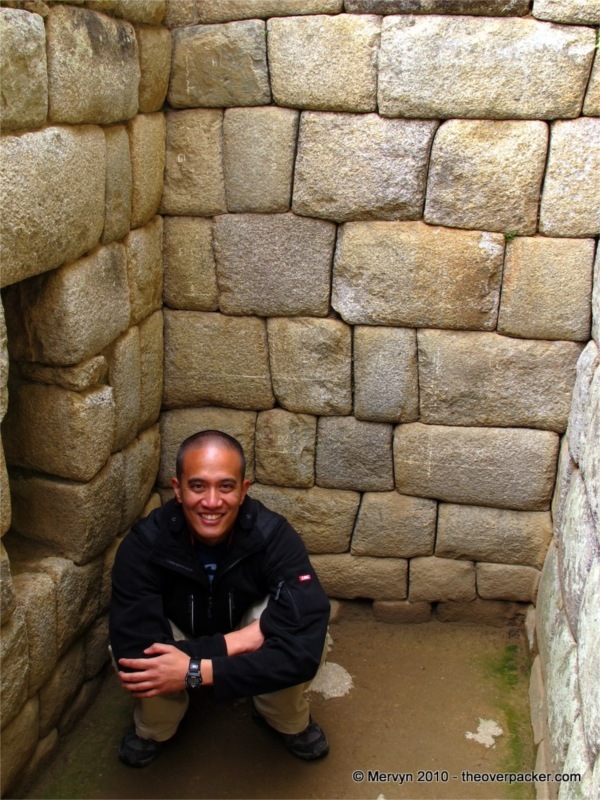 He would have come here 50 miles from Cusco with his royal attendants, a portion of his harem, and his high priests. He would have been greeted by the caretakers of his city palace. From here he could look down on the rivers and valleys below and send runners to the far reaches of his kingdom to conduct business. Back then the stone would have been white, having just been cut from an onsite quarry. Many of the walls would have been covered in white plaster. Thatched roofs would have covered the peaked buildings. 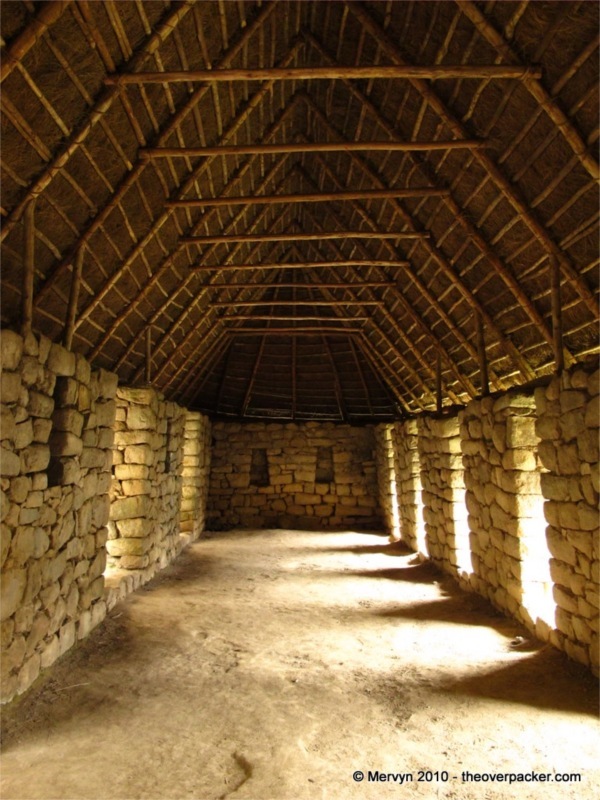 Archeological studies indicate that 60% of the structure is underground. This immense foundation was necessary because of the palace’s precarious location and the area’s frequent earthquakes. 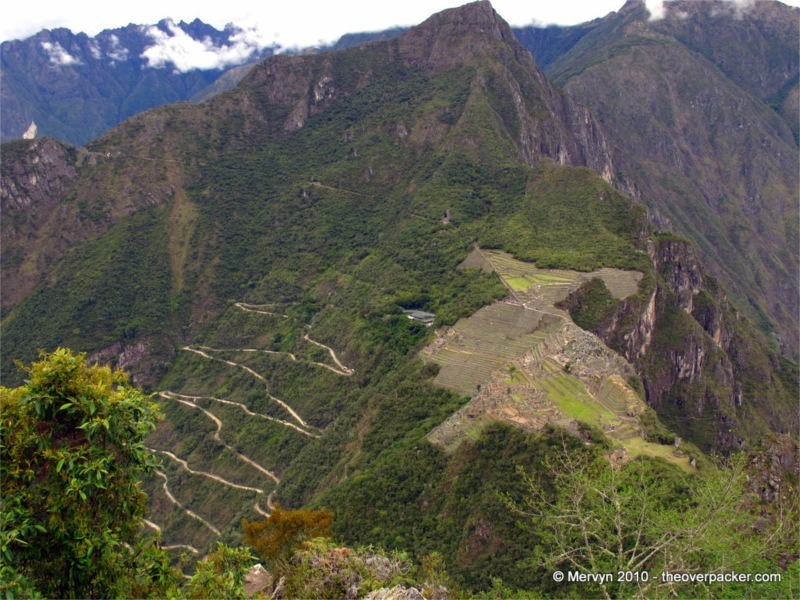 The Incan emperor chose this site because Incan royalty wanted their residences to overlook the surrounding land. Also, the mountain had a natural spring which could be used for religious ceremonies and for the comfort of the king. The engineers constructed a vast aqueduct system that provided running water for baths and for the king’s chamber (which housed the site’s only flush toilet). The emperor’s residence was situated so the he was the first to receive water from the spring, ensuring that he received the purest, holiest water. 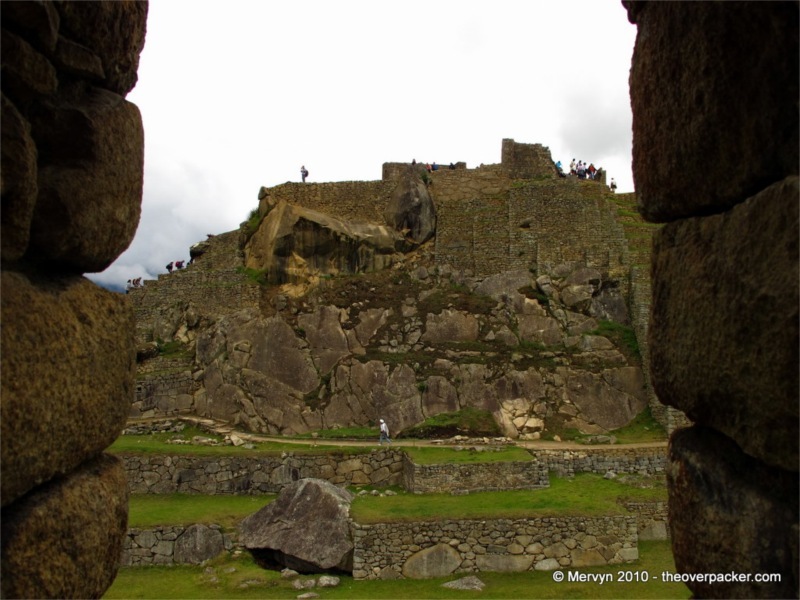 Across the complex rises Waynapicchu, a peak on which sits what looks like a fortress. In our sleepless haze, we climbed it for a top down view of the complex. The stairs were steep. The air was thin. A litter and servants would have been nice. The palace is both smaller and larger than I expected. (I’ve heard that’s the way it is with all celebrities.) Looking down on the complex is like walking into a baseball stadium for the first time—everything seems closer than on TV or in pictures. There’s an intimacy that can’t be captured on film. 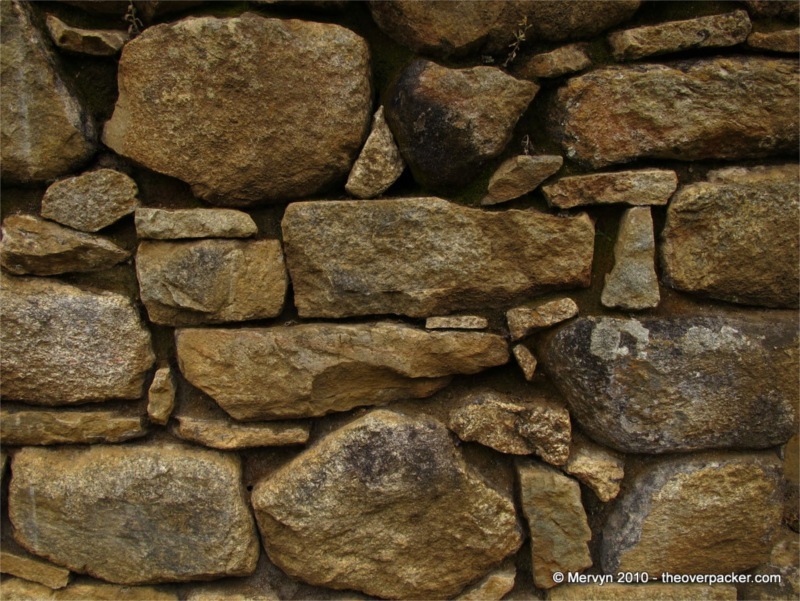 But just when you think you have a handle on the place, you start to wonder at the maze of buildings, shrines, temples, storehouses, rooms, and baths and realize that Machu Picchu might actually be big. Climb one set of steps, turn a corner, and there’s another flight leading to more stone corridors. 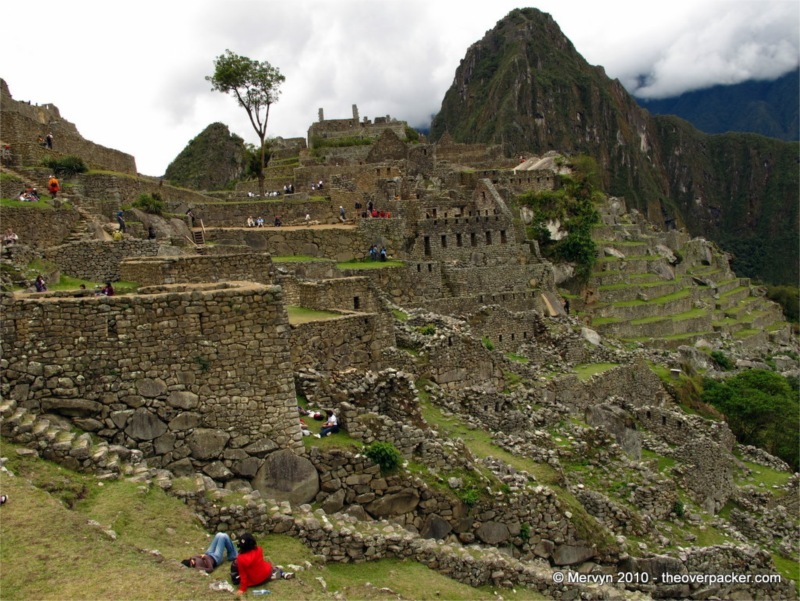 Machu Picchu is by far the best preserved Incan archeological site. That’s because the Spanish never found it and, therefore, couldn’t destroy it like they did every other “demonic” shrine. The water still runs, the condor temple and the sun temple still stand. If you visit Iniwatana during the proper solstice, a beam of sunlight from a far mountain pass still shines through a window and illuminates a sacred stone carving. The place is a feat for any time period. Strange, then, that the empire that built this place lasted only 90 years and—after 40 years of war with the Spanish—almost disappeared. Much of the history and customs has been lost because no one knows how to read the ancient knotted ropes that presumably contain the Incan records. Most of the oral history was murdered or died because of disease during the colonialization period. The wipeout was so complete that no one knows for sure why and how the Incans did what they did. Without a written history, nearly all the accounts of Incan culture were written decades after the Spanish drove the Incan leadership into exile. Most of those chroniclers got their information secondhand. It seems appropriate, therefore, that one experience Machu Picchu in a haze, the lack of clarity matching our imprecise understanding of the place. To fully appreciate the site, you must get up before dawn, hike to the palace city in the clouds, feel your head go light from the altitude, and wonder why, if the Incans were so advanced, couldn’t they have invented an elevator? 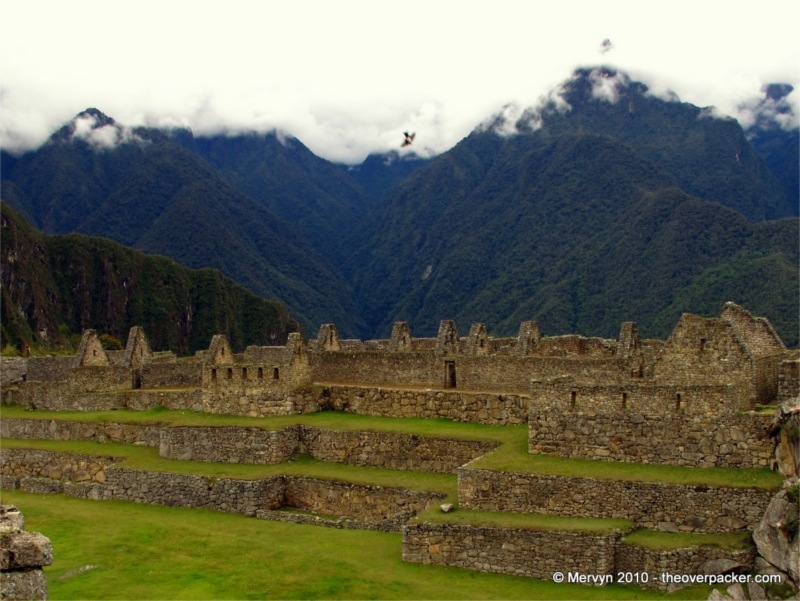 GALLERY: Click here to view many many bonus pictures of the Incan palace city in the clouds. THIS is why we paid the $30.00 and stayed in the hotel….that was a lot in 1975, especially for us, but it was worth it. Something else about 1975 – only a dozen tourists waiting to get in at first opening, which was at 8:00 a.m., as I remember. Isn’t that fun? How YOUNG we were!!! 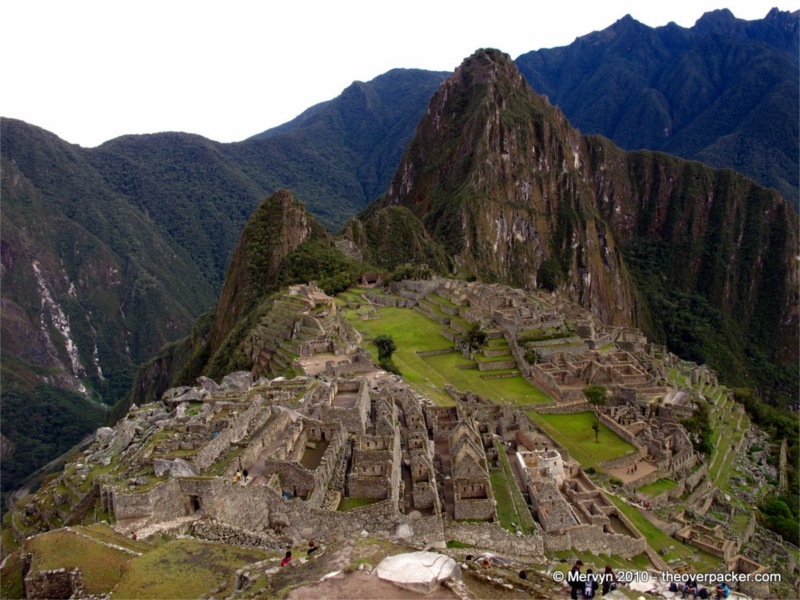 You know, looking at Machu Picchu in that photo, I can’t see the increased excavation, but that’s what I’ve read. Other photos I’ve seen show clearly that they’ve restored a lot in the last 30+ years…it’s a bit of a different experience, today. If you EVER have the chance — GO! That is a fantastic picture. I think I can see a difference between Machu Picchu then and now. Today there seem to be a lot more white walls visible from Waynapicchu. On the other hand, it just could be the angle from which the picture was taken. When we went up there, it was crowded with hikers hanging the surprisingly small peak of the mountain. I don’t we were able to get an unobstructed view from that particular rock. That’s probably the biggest difference in 35 years….we were practically alone up there. I think we saw half a dozen people on the trail up and down….total. It was a warm day, and we had no water bottles – half way up, we were licking the dew off the leaves, and I’m not making that up! I’d go back in a minute — love that place! I have been – 4 times! Well you ARE the fortunate one…! I feel privileged to have been there twice…but the last time was MUCH too long ago! That photo at the top? I have one almost exactly like it. My parents were missionaries there back in the 70s. I lived where you’re looking at for a bit. I don’t remember much of it, I just remember it was a good time. If you get a chance, you should revisit the place. I have a feeling they won’t allow people to wander around as freely as we could forever. At some point, I imagine there will be sets paths that you’ll be allowed to take. They already won’t let you walk everywhere and have roped off certain parts of the site. Ha! I remember those stairs. They are NOT fun. They’re all crooked and rounded so your feet are wobbly on them. I never appreciated flat stairs until I walked on those. So worth it though. The place is magic. I agree. 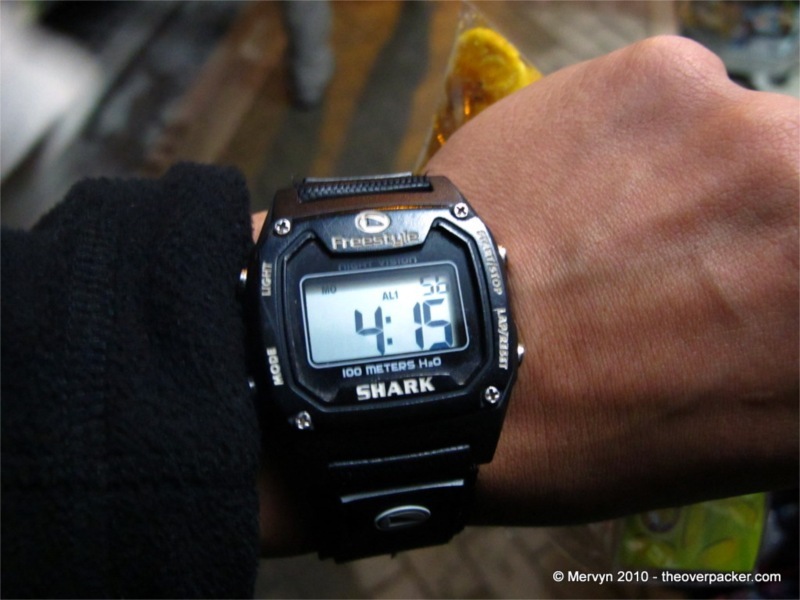 The hike is brutal that early in the morning. And it’s surprisingly hot in the dark. Perhaps all the pain is one giant resolution of cognitive dissonance that makes the place even more awesome.